FOOD MATCH: For today’s topic, we enjoyed it with a simple salad dressed with fresh tomatoes and their juice, olive oil and thin slices of Parmigiano-Reggiano. It’s a more traditional match with red meat in general, grilled chicken, tomato sauces and cheese-based dishes. WHEN TO DRINK: Barbera d’Asti is not intended for long-term cellaring, and it won’t really improve as its fruit fades against its natural acidity. It’s best to buy it and drink it soon. That said, the winery suggests that it won’t suffer from aging over two or three years. VALUE: Our local price is within range of Wine-Searcher.com’s $14 median U.S. retail. At that price and through the middle teens it’s a fine value for a good Northwestern Italian table wine. 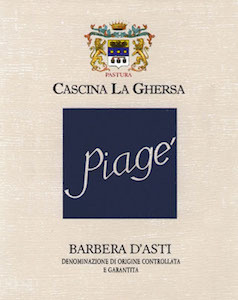 Compare prices and find vendors for Cascina La Ghersa “Piagé” Barbera d’Asti on Wine-Searcher.com. For more on U.S. availability, contact regional distributors Vanguard Wines in Columbus, Ohio, and T. Edward Wines in New York City. For links to many more good Barbara d’Asti bottlings and information about the wine and its region, check this page on Wine-Searcher.com.